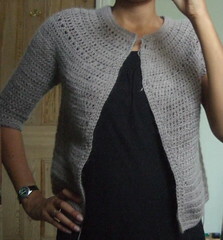 For the past couple of days, I have been trying to finish the round yoke cardigan from my first post. This was actually lost for a while – I eventually found it hidden under one of the living room chairs! I was making good progress until I got to the sleeves. I must have reworked the first sleeve at least ten times now and have now decided that I liked my first attempt best, so I will have to start again – hopefully for the last time! I have now finished the little trekking socks and the one row scarf, and am making good progress with the ruffle sweater that I am test crocheting. 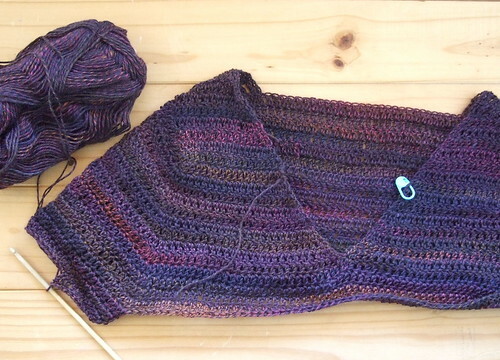 The yarn is Schoppel Admiral purchased at Knit n Caboodle. I’m only just over half way through the first ball, and will probably need less than 3 balls in total. I have never made an adult sized sweater in sock weight yarn before, but this seems to be progressing nice and quickly and is enjoyable to work on.